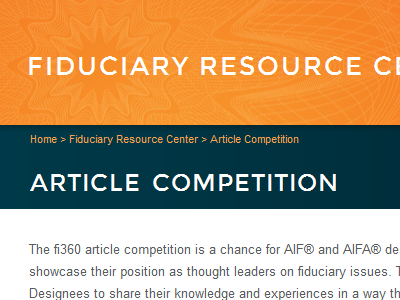 The fi360 article competition is a chance for AIF® and AIFA® designees to have their writing published and showcase their position as thought leaders on fiduciary issues. The purpose of the competition is to encourage Designees to share their knowledge and experiences in a way that helps fiduciaries better understand and perform their role. The winner will be announced at the 2013 fi360 Conference on April 18 in Scottsdale. The winner will be featured in AdvisorOne and receive a $1,000 cash prize. Read all of this year’s articles at the 2013 Article Competition. Subscribe to Marotta On Money and receive free access to the video presentation of last year’s winning entry: Ten Questions to Ask a Financial Advisor. David John Marotta: What Is A Contrarian?